The thing I like best about weather events such as Saturday’s snowstorm is that neighbors tend to come out to the street to share a little of the experience. I find it very energizing! We received round-a-bout 18-24″ of snow on Saturday. 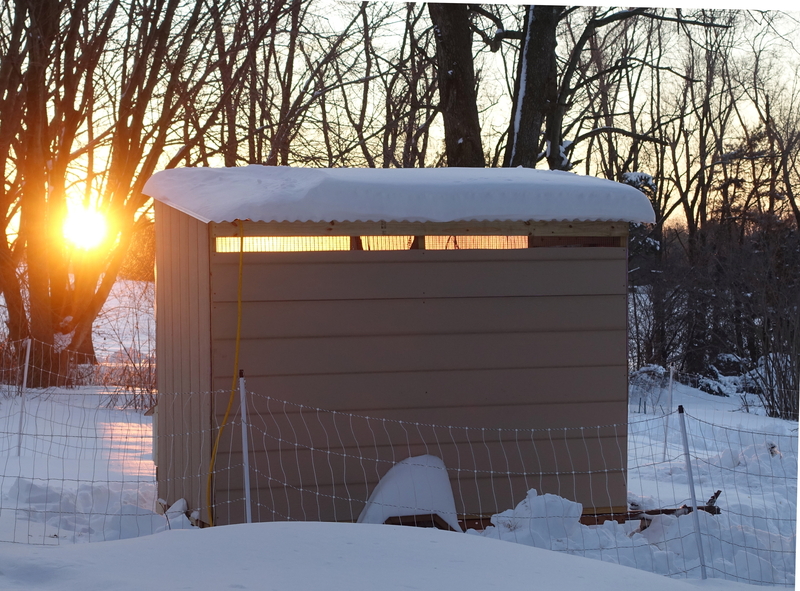 We had just finished (mostly) the chicken coop and put it in place behind the house as the first snowflakes began to fall Friday evening. We decided that the chickens could have one more day in the house but, after the blizzard, they were out! 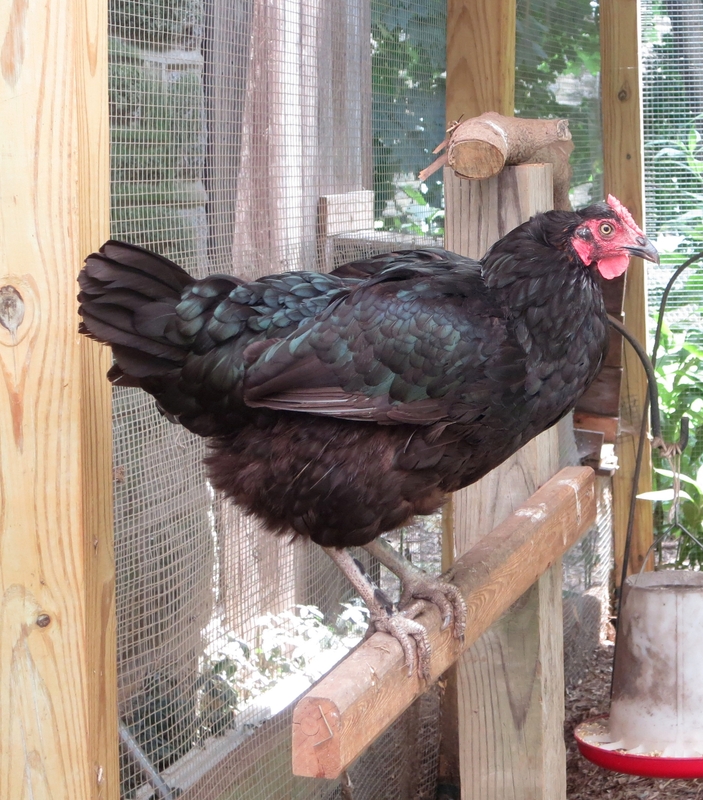 Since our last update, they took to roosting on the side wall of their bedroom brooder. All 17 of them settled on it to sleep at night…and set their alarm! On a very snowy Saturday morning, Ginkgo could still bound, pretty easily, down towards the pond. I moved a bit more slowly. I made a few trips around the orchard during snowfall to free up the fence lines but, eventually, gave up. The snow was beyond my boots and up to my knees. This is the orchard mid-day Saturday. On Sunday, we woke and took a walk to the road but found none. 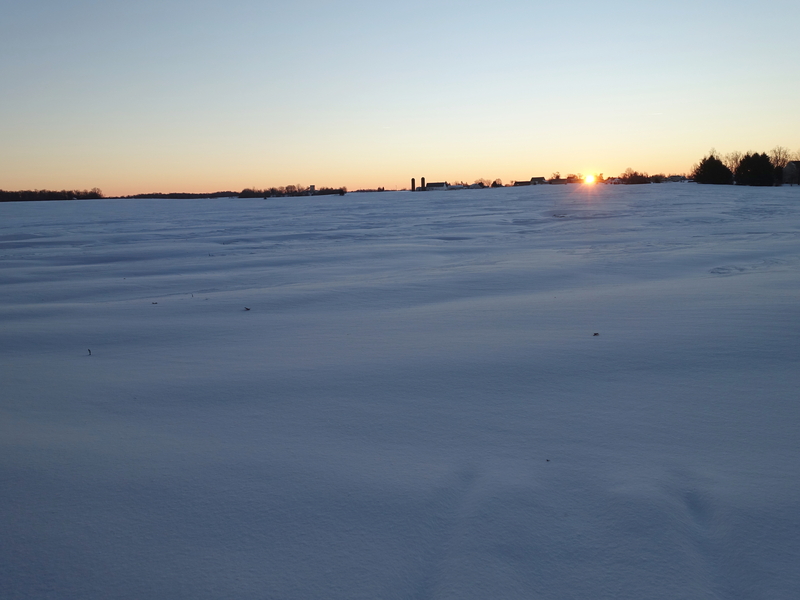 This morning, it looks much the same with a few snowmobile tracks. There is a road under there somewhere…. 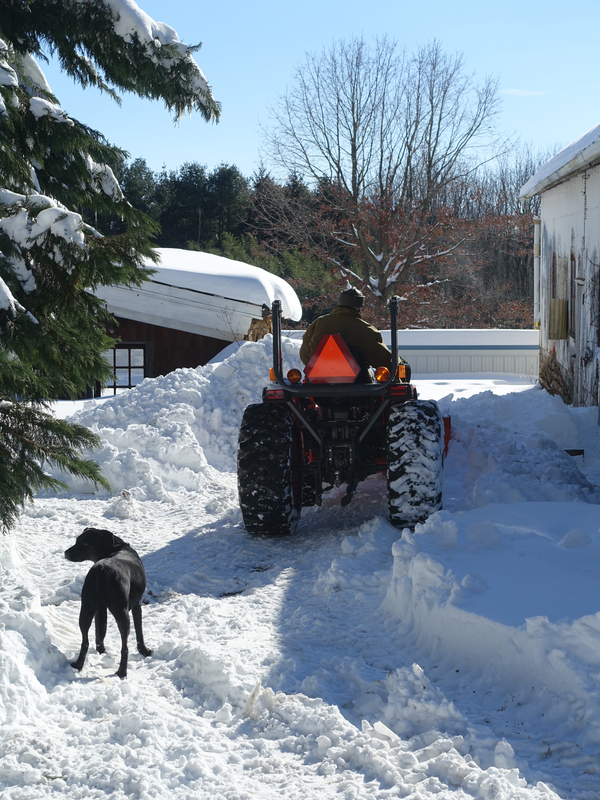 Ginkgo started choosing her paths with a little more discrimination…such as behind the tractor. 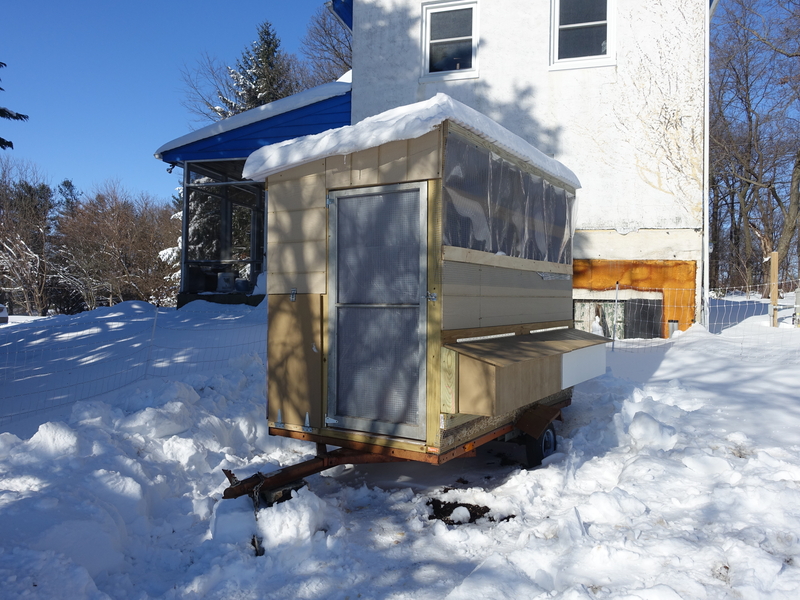 We carted the chickens to the mobile coop by 4’s and 5’s in a cardboard box to their new home. The coop window faces east and is covered with thick plastic for the winter as is the door which is facing south. There is a pop-out door to the left of the people door. I didn’t expect to need so much bracing but the trailer is hinged in the center and we needed to make it strong for when we tow it down to the orchard and over the terrain. I like that the chickens will be able to go under the trailer for shelter when they are outside. We allowed for plenty of ventilation. They are hardy (Icelandic!) chickens so I’m not too worried about the cold. However, for now, we can warm these young birds, as needed, with the heat lamp. Soon, they will become adjusted to the cold and we can stop using the lamp. The house, also, protects them from the cold north winds. We’ve built community nesting boxes. We’re not allowing them to go in there yet. They are only 6 weeks now and I don’t want them to start hanging out or sleeping in there. There are some finishing touches needed. I’d like to make a clean-out hatch under the roosts and to give it a paint job. 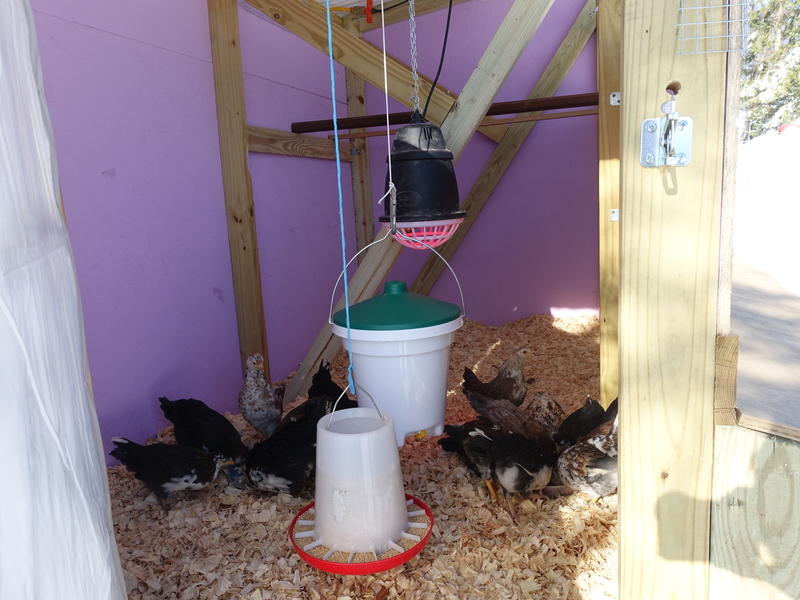 I’m, also, wanting to make feeding/drinking stations that can be filled from the outside of the coop. Most importantly, the chickens are out of the bedroom! We can transform the bedroom space into the plant nursery for the spring garden. And, THEN, maybe we’ll get to renovating the bedroom! I checked in on those winged characters this morning. They seem to be in good health and spirits…eating lots of food and calling in the morning sun. I’ll give them a day to bond with their coop and let them out tomorrow. We’ll see what happens from there. Looking forward to bringing them to the orchard in the springtime! New puppy in the house! 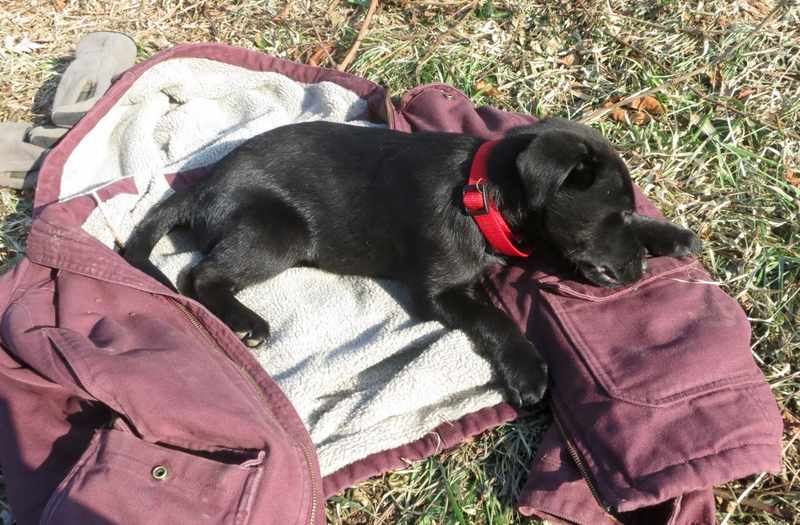 Introducing Gingko, a 3 month female lab mix. She was rescued from a high kill shelter in the south and was being fostered at a home in New Jersey. Loving her! I took advantage of warmer weather to dig 10 more holes for new trees. Gingko picked up key skills very quickly! George left his ball when he was visiting this summer. No sense to let a fine ball sit around and get dusty. Thanks, George! ….and when there are no toys to play with, Gingko has no problem entertaining herself! Gingko is livin’ the life at StellaLou! 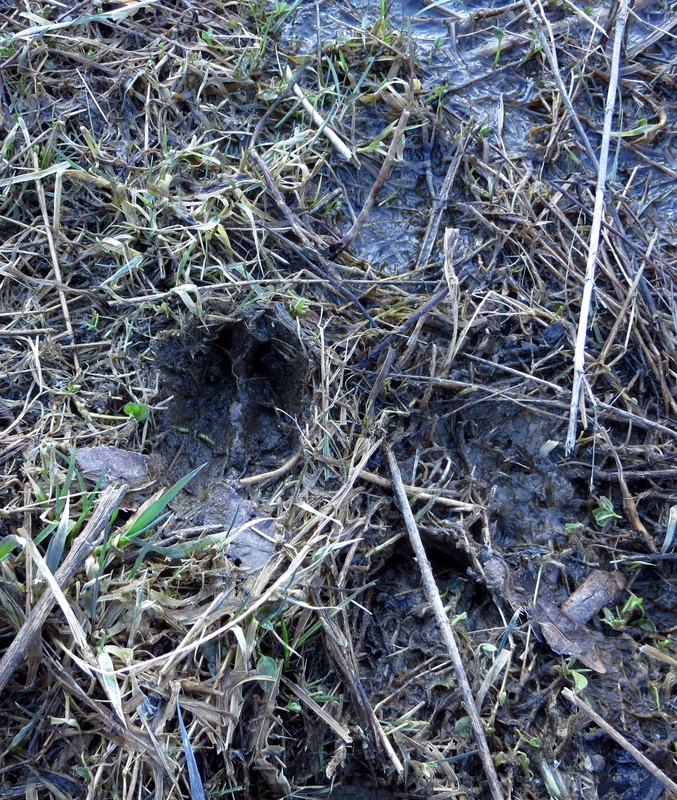 Photo of deer tracks near pond taken Mar. 7, 2013 early morning, ground slightly frozen. Signs of deer rubbing on trees and droppings also seen. Small herds, also, seen and are easily frightened.